US computing giant IBM celebrates its 100th anniversary today, a century passing since business Charles Flint oversaw the merger of Hollerith’s Tabluating Machine Company with the Computing Scale Company of America and International Recording Company to become Computing-Tabulating-Recording Company, the brand we know today as IBM. 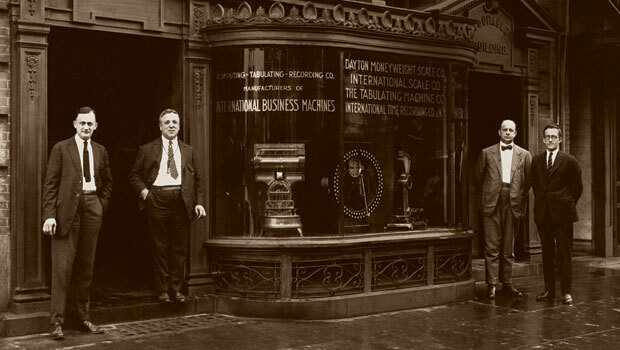 IBM is proud of is roots, telling the story of its formation back in 1911; with three independent businesses merging to become the Computing-Tabulating-Recording Company, Charles Flint’s first major move was to hire Thomas Watson Sr. as the company’s general manager in 1914. With strong leadership and an ability to integrate each company to run as one, in just ten years Watson had the Computing-Tabulating-Recording Company posting revenues of $11 million (13 times its original annual sales), employing 3384 employees, expanding overseas beyond the UK, Canada and Germany before changing its name to International Business Machines – IBM as we know it. One IBM share in 1915, with adjustments and stock dividends, would be worth 11, 880 shares today. If you went back in time, bought one hundred shares of IBM at that time, your investment would now entitle you to around $200 million. IBM’s patent innovation was evident even before the company was formed. Herman Hollerith, inventor of the tabulating machine which was used to collate US population censuses, filed his first patent soon after leaving the U.S Patent Office in 1883-84. The electrical patent was the basis for the Tabulating Machine Co., the founding member of IBM. IBM’s patent innovations aren’t often documented but the company has a large number of patents which could have seen it stand in the way of some of the most well-known software platforms we know today. IBM holds patents which could have stopped the Linux operating system from ever being released, but the company declared it would not enforce them in 2005. In 2006, IBM worked with the U.S Patent and Trademark Office and other companies to establish Peer-to-Patent project, allowing experts to submit evidence of inventions via a website, helping patent examiners assess the validity of a patent application. Dwarfing patent filings by Apple, Google, HP, Microsoft and Oracle, IBM holds 5,896 patents, exceeding the combined portfolios of all of the companies above, marking the 18th consecutive year as the US patent leader. IBM has been at the forefront of new technology, building some of the earliest computers, the first magnetic hard drives, computing languages, the floppy disk and even barcodes (in fact there are too many to list). Highlights include the IBM personal computer, introducing a computer chip by Intel and a Disk Operating System (DOS) in 1981, which was made by a little-known company called Microsoft. In 1997, IBM’s Deep Blue computer becomes the first to defeat a world chess champion, winning a six-game match against Garry Kasparov. On the final day of IBM’s first century, June 15, we will focus our company’s and the world’s attention on the scope and impact of IBMers’ contributions to our communities and our planet. Between now and then, I hope every IBMer will make his or her pledge to the Celebration of Service, and sign up to join or lead a meaningful project during 2011. I am enormously gratified that more than 100,000 IBMers have already pledged at least eight hours of service for this year. On June 15, I will be participating with other IBM volunteers in my hometown of Baltimore, Maryland, working with the city’s schools to help build interest in and capabilities for science and technology education. No matter what kind of work you choose to do, we can be confident that it will have lasting impact – making a difference to our communities, building IBMers’ skills and strengthening our teams. To help its staff, IBM has made available $12 million in grants to support their initiatives. From this, 100 Catalyst grants of $10,000 each and ten $100,000 Centennial grants for the organisations where employees volunteer. IBM insists it must never change. The company may have moved forward enormously from the days of industrial clock and meat slicer manufacturing but its pioneering spirit remains as strong as it was back in 1911. Over the last 5 years, IBM adapted its global supply chain and functional processes, resulting in $6 billion productivity savings. The company now accounting for tens of millions of shareholders, does business in over 170 countries and has invest $58 billion in research and design alone. This is ensured the company’s net income hit an all-time high of $14.8 billion, with gross profit rising from 37% to 46.1%. To every single individual, thank you. We pledge boldness in IBM’s second century to create a company that never stops moving to the future.12 Ever onward. IBM has created a dedicated website to celebrate 100 years of innovation. Here you can read all about how the company was formed, watch informative videos and view photos of IBM and its products over the past century. It’s truly impressive, if you get a chance, do make sure to check it out.